Dilemma: Should you get the Galaxy Note 9 or wait for the Pixel 3 XL? The Galaxy Note 9 is officially on sale. The entry-level model will set you back $1,000, while the beefed-up version retails for $1,250. Should you get it, or are you better off waiting until the October unveiling of the Pixel 3 XL? Nothing about Google’s upcoming flagship has been confirmed yet, but we have a good idea of what to expect based on leaks and rumors. The handset will supposedly have a massive 6.7-inch display with Quad HD+ resolution and an aspect ratio of 18.5:9. It might also have a gigantic notch (see below). When it comes to performance and storage, we expect a few differences between the two devices. The Galaxy Note 9 is powered by the Snapdragon 845 or Exynos 9810 chipset, depending on the region. It comes with either 6 or 8GB of RAM paired with 128 or 512GB of expandable storage. The Pixel 3 XL is also expected to pack the Snapdragon 845 processor under the hood, though it’s only rumored to have 4GB of RAM and 64GB of non-expandable storage. There’s a good chance we’ll see at least one additional memory variant, hopefully with 6GB of RAM and at least 128GB of space. The Pixel 3 XL is rumored to sport a single primary camera. Moving on to the cameras, the Note 9 sports the same set of dual 12MP sensors as the Galaxy S9 Plus. However, Samsung added a new scene recognition mode to identify things like plants, food, pets, and more. There’s also adjust settings that help produce a better image — something we’ve seen on other similar flagship phones. The feature sounds great on paper but doesn’t always work as advertised. Regardless, the Note 9’s camera is impressive overall (check out sample photos here). The Pixel 3 XL is rumored to sport a single 12.2MP camera on the back just like its predecessor. However, more cameras don’t always mean a better image. The Pixel 2 XL’s shooter is still one of the best out there — it can even capture bokeh images without a second lens. The Pixel 3 XL’s camera should hopefully be even better. The device is also rumored to feature two cameras on the front. One of them is said to have a wide-angle lens, allowing you to capture what are being referred to as “Super Selfies.” This could make it a better option than the Note 9’s single selfie camera, which David found “a little soft” in his review. If the rumors are true, the Note 9 will offer a lot more in the battery department than the Pixel 3 XL. The Note 9 packs a massive 4,000mAh battery, up from the Note 8’s 3,300mAh. The Pixel is expected to come with a 3,430mAh battery, quite small for a device with such a big screen. Interestingly, this is a decrease from the 3,520mAh battery found in the Pixel 2 XL. The Note 9 is IP68 rated, which means it’s dustproof and will survive in up to five feet of water for a maximum of 30 minutes. There’s no word on what the Pixel 3 XL will offer in this department, but we expect it to come with either an IP67 rating like its predecessor or IP68 like the Note 9. In any case, you won’t have to worry if you get the device wet. The Pixel 3 XL will offer a clean, bloat-free software experience. The phones will also have different software experiences. The Pixel 3 XL will run a vanilla version of Android 9.0 Pie for a clean, bloat-free experience. As expected from Pixel devices, the Pixel 3 XL will also be among the first updated to the upcoming Android versions. The Note 9 currently runs Android 8.1 Oreo. It will upgrade to Pie somewhere down the line, but there’s no word on exactly when. 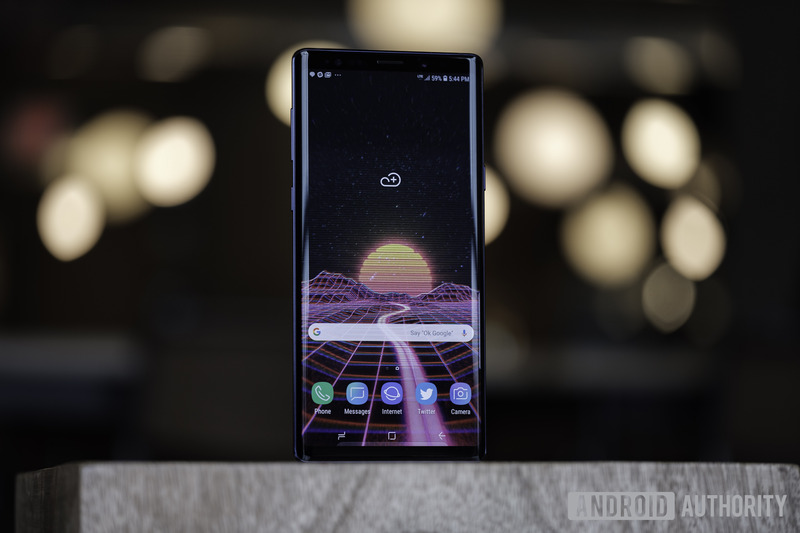 The phone also comes with Samsung’s Experience skin on top of Android, which changes the look of the OS and has a few additional features, along with Samsung’s various apps. Your software preference will very much depend on what kind of user you are. If you need all the bells and whistles, you’ll probably prefer the Note 9’s software. The Pixel 3 XL will probably be the phone for you if you want a simple, clean experience. The Note 9 has a headphone jack, an iris scanner, and the popular S Pen, which is one of its main selling points. It offers loads of features and supports Bluetooth Low Energy (BLE), allowing you to do things like launch the camera and take a selfie by pressing the button on the stylus a few times. The S Pen is what makes the phone stand out and if you see yourself using it, the Note 9 is definitely a better option than Google’s upcoming flagship. On the other hand, the Pixel 3 XL is expected to come with a few features on board that you won’t find on the Note 9. These include dual front-facing speakers and the Active Edge feature, which lets you open Assistant — and hopefully any other app — just by squeezing the device. But overall, the Note 9 does look to offer more when it comes to specs and features at this point. Now let’s talk about the design. A ton of Pixel 3 XL images have already leaked, so we already know what to expect here. In my opinion, the device doesn’t look nearly as good as the Galaxy Note 9. I have nothing bad to say about its back, which is similar to the Pixel 2 XL. Based on the pictures we’ve seen so far, it’s a combination of smooth black glass on top and frosted glass on the bottom. The front is a different story. The larger notch and bottom bezel below the display really turn me off. I much prefer the Note 9’s simple — and notch-less — front, with thin and symmetrical bezels. The glass back’s minimalist design looks nice too. Of course everyone’s tastes differ, and you might feel entirely different about the looks. Check out a few images of both devices below and let me know in the comments which one you think looks best. It all depends on what you’re looking for. Based on the latest rumors, the Pixel 3 XL will have a few advantages over the Galaxy Note 9. It could sport a dual-camera setup up front, a stock version of the latest Android, two front-facing speakers, and the same Active Edge as the Pixel 2. It may also offer a larger display, which can be a good or a bad thing depending on who you ask. If the rumors are true, the Note 9 packs a much larger battery as well as more RAM and storage. It also features a headphone jack, an iris scanner, the S Pen, and expandable storage, all of which is unlikely on Google’s next flagship. Which device to get comes down to the features you value more. The Note 9 definitely offers more bells and whistles overall, but the Pixel 3 XL may have loads of features we haven’t heard about. The phone hasn’t even been announced yet, so we don’t know everything about it. But generally speaking, it should be a great choice for those who see a lot of value in stock Android and quick updates. Those who prefer more power user features are most likely going to have a better time with the Note 9. Depending on your market and what kind of payment plans you have available, pricing may also play a major role in your decision. There’s no word on how much the Pixel 3 XL will cost, but we can get a good idea by looking at its predecessor. The 64GB variant of the Pixel 2 XL launched with an $850 price tag, while the beefed-up version with 128GB of space went for $100 more. Based on the latest industry trends, I’d say the Pixel 3 XL will cost more. It will likely still be a little cheaper than the Note 9, which starts at $1,000, but it’s hard to say by how much. Which one would you get? Let me know in the comments!